Visitors expect a web page to load in 3 seconds or less. After 3 seconds, they will no longer wait for your site to load – they’ll just move on to your competitor’s site. The end result – potential customers gone because of a few seconds difference. Google is also concerned about site speed – you can slip in rankings, if your site is consistently slow to load. 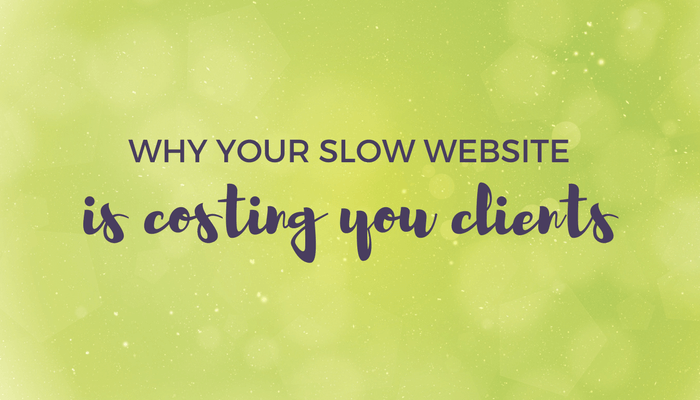 The bottom line is that regardless of how awesome your content is or how much of a perfect fit your services are, if your site doesn’t load quickly, it’s likely that potential clients won’t even stick around long enough to see it. So, what’s your current site speed? Find out using the Pingdom Website Speed Test. 1. Use a quality host - Not all hosting is created equal. Hosting plays a huge part in how fast your site loads. A slow server is the main reason I see for a site not loading quickly (yes, I'm looking at you GoDaddy). You get what you pay for. If you are paying the equivalent of a Starbucks coffee every month in hosting, then it is time to scrap the budget host. If you invest in only one thing for your website, invest in a quality host. My favorite is Flywheel. 2. Enable caching - Caching is storing something temporarily for fast retrieval later on. This means that when someone lands on your site, there’s a copy already saved and ready to be loaded, which saves time. Caching can be done with a plugin and will make a big difference in your site's loading speed. There are many options, but I like W3 Total Cache, or if you are a little more technically inclined then you can try WP Super Cache. Some hosts, such as Flywheel, handle caching at the server level, eliminating the need for caching plugins. Server-side caching is more efficient than plugin-based caching. 3. Minimize your plugin use - Too many plugins will slow your site so deactivate and delete any unnecessary plugins. Also, keep in mind that some plugins are more resource-heavy than others, so make sure to weed those out if possible. 4. Optimize images - One of the culprits for slow page load times are the images on your page. I am not suggesting that you get rid of them. The trick is to make your images "smaller" by resizing and compressing your images before uploading them onto your site. By switching to a quality host, enabling caching, removing unnecessary plugins and using properly sized images, your site will load faster. And a faster site means people will stick around longer, which is a win-win for everyone.